Diane Kruger has consistently shown her impeccable style and exceptional taste, whether on red carpet events or while out and about in whatever city she finds herself in. In January, she was spotted looking effortlessly cool while running errands in West Hollywood, and just recently we saw her rocking prints at the Peter Pilotto for Target launch. Diane’s first stop was the photo call for The Better Angels, which was held at the Grand Hyatt Hotel. She looked pretty in a black-and-white embroidered duchess satin dress from Giambattista Valli’s pre-fall 2014 collection. It features a high round neck, an A-line waist, a sequined bodice, a flared skirt, and a floral pattern. Her hair was styled in a retro-inspired twisted updo, which showed off her flawless makeup. Not content with simply looking chic and pretty, Diane wore a pair of chain-embellished ankle boots from Chanel. She added a cool and edgy vibe to her outfit with these fall 2013 boots, which she styled with black socks. Still wearing the retro-style coiffure from the photo call, Diane changed into a different ensemble and headed to the premiere of The Galapagos Affair: Satan Came to Eden at Haus der Berliner Festspiele. The German beauty looked every bit the star that she is in her pre-fall 2014 Chanel outfit. She wore a white organza top with a bow accent, which she wore underneath a black organza jacket and a matching sheer-hemmed mid-length skirt adorned with red, white, and blue star appliqués. Diane finished off her look with a black minaudière and a pair of “Nudist” sandals from Stuart Weitzman. For the big finale, Diane stepped out on the red carpet looking glamorous in Elie Saab at the premiere of The Better Angels. The 37-year-old actress stunned in a white gown from the designer’s pre-fall 2014 collection, which features long sleeves, a crew neck, and a sheer-paneled skirt. Her beautiful gown was styled with a thin white leather belt, bold red lips, an assortment of gold jewelry from Bulgari, and a metallic leather clutch from Sergio Rossi. After appearing in two events in the same retro-style twisted updo, Diane let her hair down and kept one side tucked behind her ear. We couldn’t get a good view of her shoes due to the length of her dress, but Diane was wearing the “Isadora” platform pumps in blush suede from Charlotte Olympia. 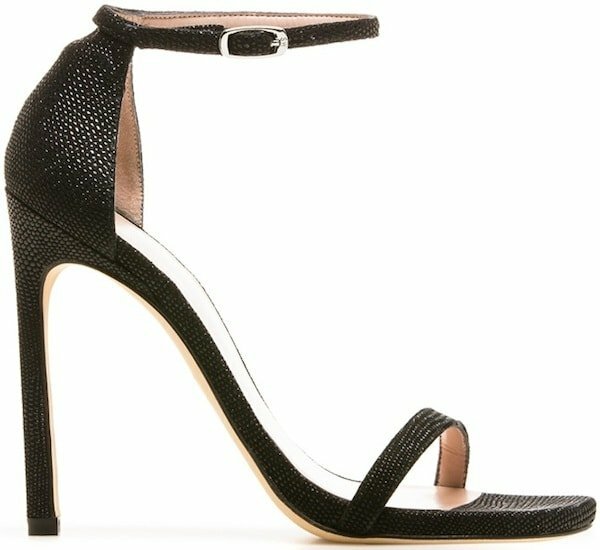 The Isadora platform pumps from Charlotte Olympia feature buckled ankle straps, peep toes, sheer panels, crossover straps, covered stiletto heels, iridescent round-cut Swarovski crystals, gorgeous blush suede, and the brand’s signature island platforms. Which of Diane’s looks is your favorite? Feel free to let us know in the comments section below. Be sure to browse through our Diane Kruger, Chanel, Stuart Weitzman, and Charlotte Olympia pages for more stunning shoes, and keep checking back with us at Your Next Shoes for the latest updates on shoe-related news.